This is the latest in a series of ‘Landmark Papers in…’ from Oxford University Press and now it is the turn of our specialty. The title is self-explanatory. The Editors decided that ‘landmark’ papers were those publications that attracted a high scientific citation index, that still impact on current day practice or that changed our thinking significantly. After a career in otology, there is many a ‘household’ name one attaches to what are almost legendary studies. Obvious examples include Minor and semicircular canal dehiscence, Kemp and otoacoustic emissions, or Epley and those otoconia. Indeed, half the fun was to read the 99 chapter titles and predict the paper chosen. 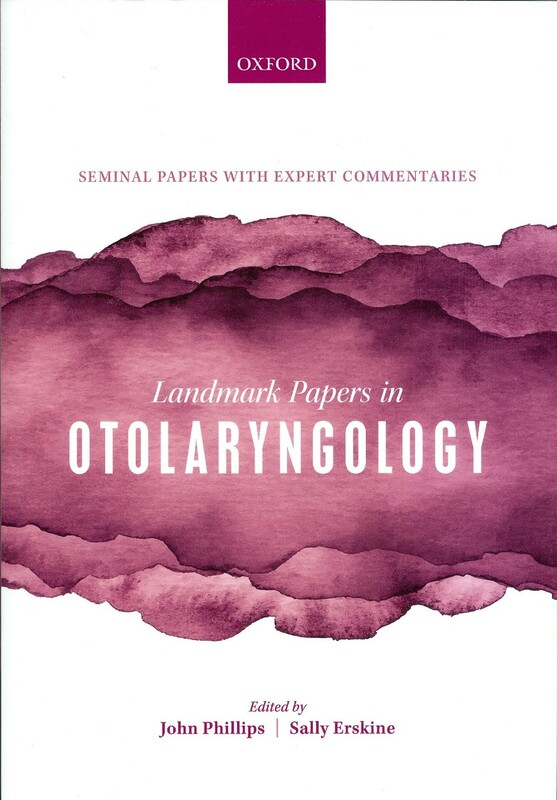 This book is based on five years of running a Journal Club in the Department of Otolaryngology at Norfolk and Norwich University Hospital. Actually, they made the inspired choice to hold it in the local pub instead! In the traditional style of such events then, each paper is briefly presented with a summary of methodology and findings. What really impressed though was the quality of critique then applied. This reviewer’s prize goes to Chapter 32 on the legendary Copenhagen sham study of endolymphatic sac decompression. The critical review and presentation of a subsequently published re-interpretation of the data was superb and a real eye-opener to this reader. I thought Peter Webber’s three chapters on the changing UK legal views on consent were, alone, enough to justify the book in any ENT department. There is a multi-author (largely UK-based) contribution, but still a praiseworthy uniformity of style. Despite the occasional Cochrane Review, or even fewer randomised controlled trials, it will not surprise readers that the landmark papers which shape our practice are generally of a low level of evidence. They tend to be small case series or ‘how I do it’ efforts. I had planned to review this as a ‘dipping in’ exercise, but instead read it from cover to cover in 24 hours. This has major relevance to trainees, who were not even a twinkle in an eye when many of these papers were published. The evidence base for our work is a classical examination topic of course. Few candidates in a rhinology examination fail to mention Chandler, but seem to struggle with his five stages of orbital sepsis. Cotton’s cricoid split can still attract some very bizarre descriptions indeed. This book, then, is a very easy read and a real bargain for its content. It is ideal for examination preparation and a real ‘nostalgia’ trip for those at the other extremes of a career. It is superb at teaching the skills of critical appraisal of the literature. Finally, it would make a great cheat for anyone running a journal club, if sneakily done. Select any of these papers, chose a presenter and then turn up armed with a critique that will amaze the attendees.